Dmitri Shostakovich Autograph Musical Quotation Signed. Handwritten musical quotation inscribed by Russian composer and pianist Dmitri Dmitriyevich Shostakovich in Russian above the opening three bars of Shostakovich’s Symphony No. 5 in D minor (Op. 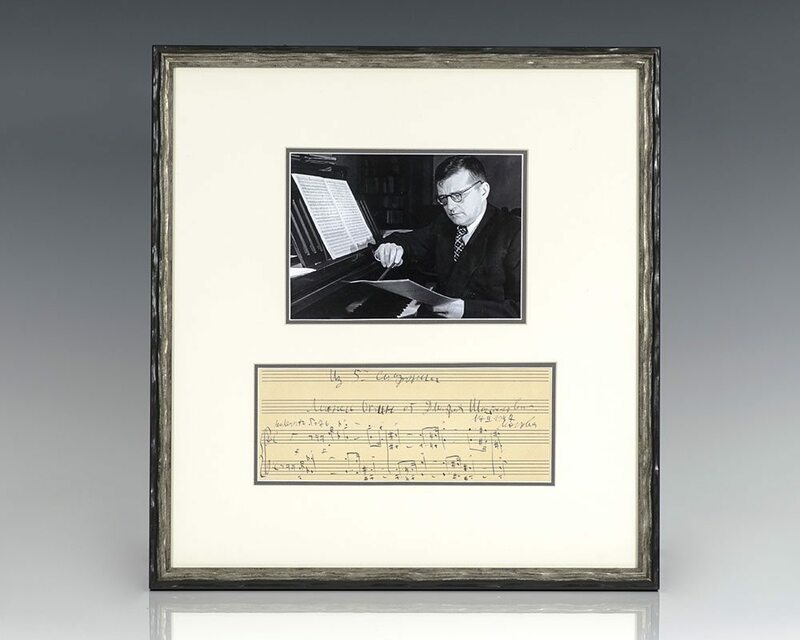 47) on a two-stave system with holograph tempo directive and title, “To Lionel Okvin from Dmitri Shostakovich 17th February 1947.” Double matted and framed with a photograph of Shostakovich. The entire piece measures 14.75 inches by 15.75 inches. Rare and desirable. Regarded as one of the major composers of the 20th century, Russian pianist Dmitri Dmitriyevich Shostakovich's orchestral works include 15 symphonies and six concerti in addition to three operas, several ballets, and a considerable quantity of film scores including music to the 1956 film The First Echelon. Shostakovich achieved fame in the Soviet Union under the patronage of Soviet chief of staff Mikhail Tukhachevsky, but later had a complex and difficult relationship with the government. Musicologist David Fanning concludes in Grove's Dictionary that, "Amid the conflicting pressures of official requirements, the mass suffering of his fellow countrymen, and his personal ideals of humanitarian and public service, he succeeded in forging a musical language of colossal emotional power."